According to the National Center for Charitable Statistics (NCCS), more than 1.5 million nonprofit organizations are registered in the U.S. This number includes public charities, private foundations, and other types of nonprofit organizations, including chambers of commerce, fraternal organizations and civic leagues. The nonprofit sector contributed an estimated$905.9 billion to the US economy in 2013, composing 5.4 percent of the country’s gross domestic product. So there’s no doubt nonprofits make a significant contribution to the U.S. economy. A 501c3 is a major time commitment. Don’t expect to submit one round of paperwork and be done. The application and filing process can take upwards of 18 months so be sure to build that time into your plan or you will be frustrated and disappointed by the length of the process. But don’t get excited just yet– the administrative work doesn’t end there. As a 501c3 you are required to log minutes at every meeting. On top of that, it is a necessity to develop a system for documenting all correspondence, transactions, etc. and this will be another huge consumption of time. The efficiency of the system you establish and the reliability of your secretary will determine just how much time is spent on these administrative duties so it wise to thoroughly investigate your options when it comes to administrative functions. Cash is king when it comes to setting up and maintaining a nonprofit. Before starting on the road to becoming a 501c3 be sure you are equipped with monetary resources or seed money. You can gather the funds needed to get started by organizing fundraisers and/or reaching out to potential donors. One of the toughest lessons I’ve learned as the President of a 501c3 is that “free” usually means unreliable and as tempting as it may be to accept free services it is incredibly difficult to hold free accountable. This approach can often set you back in your progress so if you have a steady flow of funds, those free offers become much less tempting. A nonprofit isn’t a “fly by the seat of your pants” type of organization. It needs to be run like a business and therefore needs a solid business plan. You have numerous people investing their time and money into your organization and they are depending on it being a success. Without a well-designed business strategy your nonprofit won’t have much of a future. Your business plan should be formal, not written on a napkin over coffee. It should contain business goals, and detailed plans for achieving them. Additionally, an effective business plan also carefully outlines roles and responsibilities for each of the board members that will allow you to hold you board responsible for their actions, or inactions. This plan, once developed, is also a great tool for seeking out investors who will be interested in the content of the plan so they understand the long term goals of the organization. You will need to have a board of trustees as a 501c3 and one of the biggest mistakes you can make is creating a board of friends and family without properly vetting the candidates. Treat this process like you are conducting interviews for a job – in the end you want to end up with constructive individuals that will allow you to have a reliable board. You want to make sure your board members have the expertise and passion needed to be successful but more importantly you want to make sure they share the same vision and values. Alignment of your board is critical. 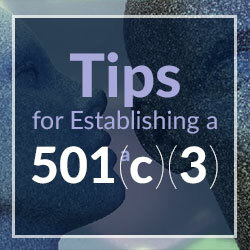 In the end, it is about being thoughtful and prepared for what a 501c3 entails. Without this basic knowledge and preparation you will make an already tedious process of establishing a 501c3 even more difficult. You don’t want to start your organization behind the eight ball. Kevin Lombardi, President of Multiple Sclerosis Community Foundation and a Director with the Government Healthcare Solutions practice within Navigant Healthcare. He is a healthcare and government sector business development executive with more than 20 years of experience in sales, strategy and healthcare financing. Mr. Lombardi serves as member of the Board of Trustees for the National Multiple Sclerosis (MS) Society. He is a national fundraiser, spokesperson, and advocate. He is responsible for developing a model for a national Social Security Disability Insurance (SSDI) outreach program – this assists individuals gain their federal entitlement. He has developed a national corporate sponsorship model operating in 10 states, 137 stores which contributes a percentage of profit in annual giving.